* "Pour un mode de production, libre, durable et solidaire". i.e. for a free, fair and sustainable mode of production. design in market entities entails planned obsolescence as market goods have to remain scarce; open design communities inherently design for sustainability, interoperability, inclusion, etc .. The model of the reMaker society is potentially significant for two reasons. Firstly, decentralised, participatory ‘low overhead’ production models make it conceivable that at least some of the material culture that defines modern societies might be sustained and reproduced outside of the integrated formal economy that currently straddles the globe. 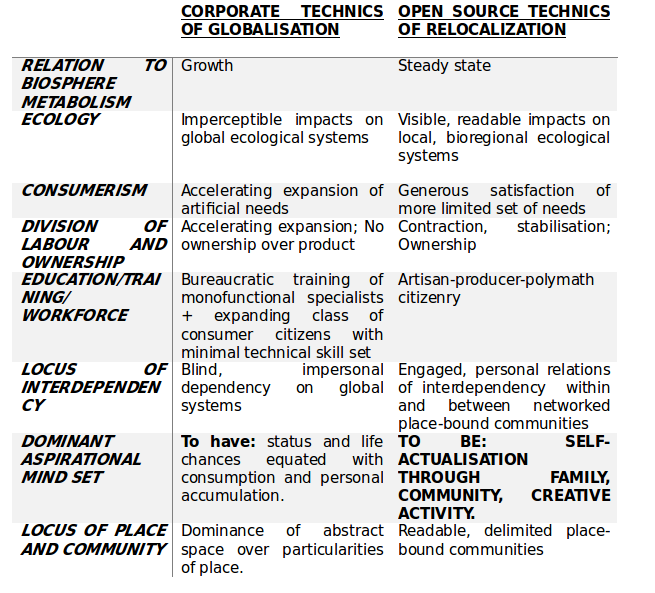 By substituting for this globally integrated market, a series of networked and more embedded (in Polanyi’s sense) bioregional economies, the reMaker model would not obviate the cycling of growth, collapse and reorganization phases. But it would eliminate the possibility of large scale systemic collapse, whilst i.) reducing the local and regional ecological impacts of growth and ii.) the social consequences of periodic retrenchment. * P2P Accounting for Planetary Survival: Towards a P2P Infrastructure for a Socially Just Circular Society. By Michel Bauwens and Alex Pazaitis. Foreword by Kate Raworth. P2P Foundation, 2019. How shared perma-circular supply chains, post-blockchain distributed ledgers, protocol cooperatives, and three new forms of post-capitalist accounting, could very well save the planet. "Personal-scale manufacturing machines ... enable small manufacturers to make one product at a time in response to customer demand, and scale up production as the product sells. ... Regular people and small manufacturing companies that lack investment capital will be able to set up low investment, “start small and scale up as it goes” businesses. With local, onsite production, long-distance shipping of the completed item is no longer necessary. Products and parts can be made only when they’re needed, saving on storage space and the costs of maintaining un-used goods and products." "A green economy is the ultimate knowledge-based economy: by definition, it replaces materials and energy with human intelligence. Both EPR and the non-governmental certification systems are based on the life-cycle approach and, increasingly, rigorous life-cycle assessment (LCA). But qualitative development involves far more than simply new values and information; it also demands a market and regulatory revolution, entailing a gradual—but fundamental—shift in the form, content and drivers of economic development. For a growing number of green thinkers, the main elements of this restructuring come down to (1) an increasing focus on producing services rather than products, and (2) reorganization of production and consumption in closed-loops, either integrated with, or imitating, ecosystems—what’s been called “economic biomimicry.” This cannot be achieved simply by beefing up environmental protection against nasty brown markets and production processes, but by a transformation that increasingly establishes social and ecological values as the prime driving forces of a new kind of market." The Role of Technology in Current Ecological Problems. Interview of Alf Hornborg interviewed by Adam Robbert & JP Hayes. Information Technology is Good for the Environment and for the Climate. Joe Romm. vs. How Sustainable is Digital Fabrication? Paul Mobbs: 1) The “Limits to Technology”: Ecological Boundaries of the Information Age. :  2) Practical Guide to Sustainable IT. Why is Open Hardware Inherently Sustainable? Michel Bauwens; however, the current practices still fall short of the promise: Potential of Open Design for Eco-Efficient Product Development. But, there is hope: 10 Open Hardware Projects to Save the Earth. David MacKay . Sustainable Energy – Without the Hot Air. Vaclav Smil . Making the Modern World: Materials and Dematerialization. : dematerialization works but is systematically offset by growth imperative. The Thermodynamic Efficiencies of Peer Production. A project of the Blaqswan's Collective in collaboration with the P2P Foundation. Pages in category "Sustainable Manufacturing"
The following 200 pages are in this category, out of 252 total. This page was last modified on 13 March 2019, at 12:19. This page has been accessed 4,569 times.